Hitachi Seiki HC400 4-Axis 2-Pallet All Purpose Horizontal achining Center s/n HC40570 w/ Fanuc System 15-M Controls, 30-Station ATC, CAT-40 Taper Spindle, 4 th Axis Thru Pallets, (2) 16” x 16” Pallets, Oil Cooler, Chip Auger, Coolant. Enshu VMC650 CNC Vertical Machining Center s/n 8206 w/ Fanuc 11M Controls, 30-Station ATC, CAT-50Taper Spindle, 3500 RPM, Hand Wheel, 32” x 72” Aluminum Top Plate, Coolant. Kuraki KV-500 CNC Vertical Machining Center w/ Yasnac MX1 Controls, 20-Station ATC, BT-40 Taper Spindle, 13 ½” x 32 ½” Table, Coolant. Bridgeport / Hasbach 3-Axis CNC Vertical Mill w/ Bandit Controls, 2Hp Motor, 30-Taper Spindle, 60-4200 Dial Change RPM, Power Drawbar, 9” x 42” Table. Takisawa TC-2 CNC Turning Center s/n THRZ61363 w/ Fanuc Controls, 8-Station Turret, Hydraulic Tailstock, 8” 3-Jaw Power Chuck, Coolant, LNS Hydrobar Type 6.42-HS- 5.2 6-Tube Hydraulic Bar Feed s/n27.293. 1996 “The American Way” mdl. AW-100 CNC Cross Slide Lathe s/n 600L-109050 w/ American Way CNC Controls, 16C Spindle, 5C Collet Nose Adaptor, 6” x 12” Table, Coolant. Herter mdl. JH-1752 17” x 52” Geared Head Gap Bed Lathe s/n 1339 w/ 40-2070 RPM, Inch/mm Threading, Tailstock, 5C Collet Closer, 12” 3-Jaw Chuck, 14” 4-Jaw Chuck. Feeler / Ramco mdl. 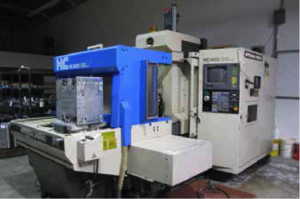 RML-95 Second OP Lathe s/n 730702 w/ 230- 3500 RPM, 6-Station Turret, Cross Slide, 5C Collet Closer, Coolant. McLean Automatic Speed Lathe w/ McLean PLC Controls, (2) Cross Slides, Drill Slide, 5C Pneumatic Collet Closer. GMN Type MPS3-132 8” x 24” Automatic Hydraulic Rotary Surface Grinder s/n 9205 w/ GMN Controls, 7” x 18” Magnetic Chuck, 3-Speed Grinding Head, Coolant. 6” Belt Sander w/ Stand. Pehaka 8” Automatic Horizontal Band Saw w/ Auto Feed, Part Stop, Coolant. Ramco / T-JAW mdl. T-400 16” Vertical Band Saw s/n 40774 w/ Blade Welder, 22” x 24” Table. 10Hp Horizontal Air Compressor w/ 2-Stage Pump, 80 Gallon Tank. Ingersoll Rand 5Hp Vertical Air Compressor w/ 80 Gallon Tank (NEEDS WORK). Rockwell / Delta Variable Speed Pedestal Drill Press w/ 450-4700 RPM, 12” x 18” Table. (2) 11” x 16” x 17” Aluminum Tombstones w/ 16” x 16” Base. (2) 4-Position 5” x 17” Tombstones w/ 16” x 16” Base. 5C, 3J and R8 Collets. Brown &amp; Sharp MicroVal CMM Machine s/n 052505 w/ Renishaw TP-1S Probe Head, Glass Scales, 18” x24” Granite Table, Brown &amp; Sharp Micromeasure II Plus Software. Mitutoyo PJ-300 12” Optical Comparator s/n 3111 w/ Micrometer Readouts, Surface and Profile Illumination. MicroVu mdl. 500HP 12” Optical Comparator s/n 21092. Wilson mdl. 4OUR Rockwell Hardness Tester s/n 1048. Brown &amp; Sharp 8” x 36” Bench Center w/ Acces. Mitutoyo Gage Blocks and Angle Blocks. Mitutoyo OD Mics, Depth Mics, Disc and ID Mics. Mitutoyo and CSE Vernier Calipers. Pin Gage Sets to .750”. 48” x 72” x 15” 4-Ledge Granite Surface Plate w/ Stand. Precision 48” x 60” x 6 ½” Granite Surface Plate w/ Roll Stand. Mojave 36” x 60” x 8” 2-Ledge Granite Surface Plate w/ Stand. (2) 18” x 24” x 3” Granite Surface Plates. B.B. Miller Electric Forklift w/ Charger. 5-Section Mechanical Assist Mobile Storage System. Minolta mdl. 3050 Office Copy Machine. Extrusion and Tube Stock w/ Racks.